In the Northern Europa, Denmark, well - preserved remains with burial equipment were rarely discovered in the wooden coffins. One of such discoveries was a coffin with remains of a girl, made of the whole log. The girl was not traditionally dressed; the short string skirt indicated that she may have been a dancer. She was buried at 1370 BC. The combs were discovered in the coffin of the Egtved girl and some other graves. 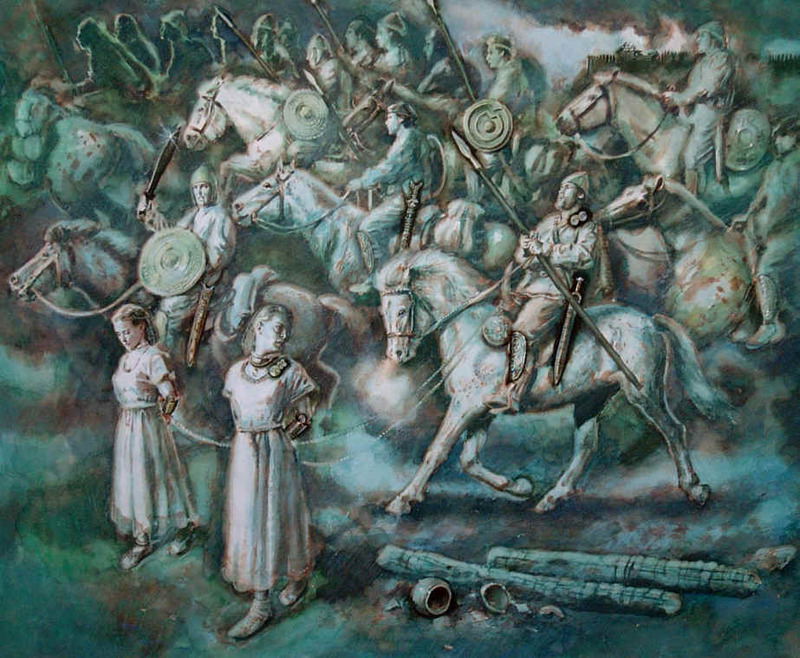 The scene of a group of warriors originated under the direction of archaeologist Milan Salaš and Prague Museum experts. Late Bronze Age is linked with frequent use of bronze, not only for making jewellery, but also tools, weapons and armour. The mining of ore and its processing reached its peak. 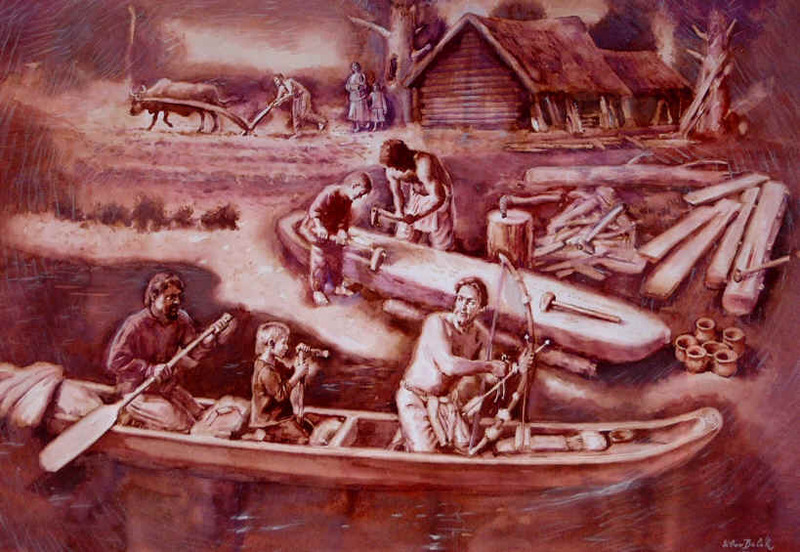 Mythology with boat themes and Sun symbols is being expressed through art. 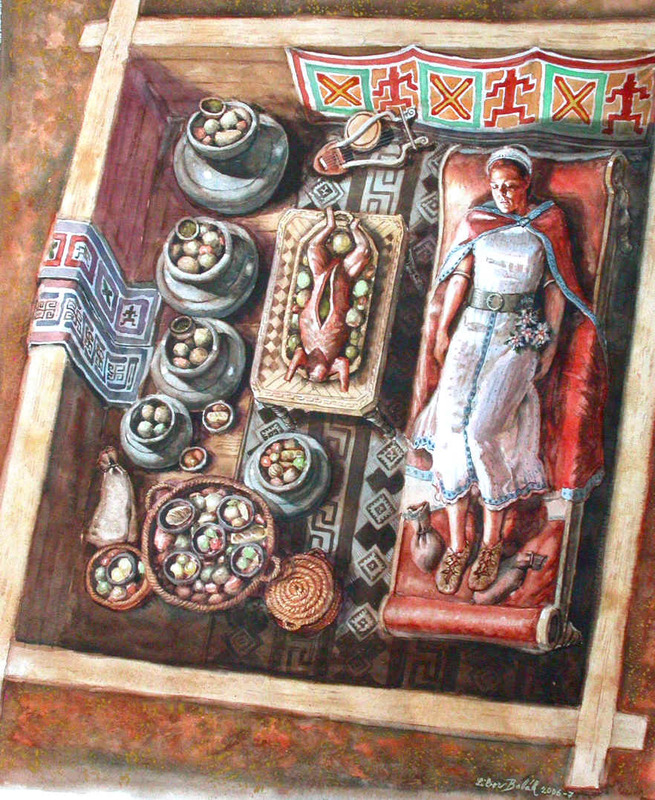 Burials show unusual practices, where some people were sacrificed, their meat was cooked and apportioned, much like animals intended for consumption. An example of such a major sacrificial place is Blučina u Brna. Early iron Age – Hallstatt culture 750–450 / 400 B.C. Reconstruction of a bronze bull with embedded iron triangles and stone eyes. He was discovered by a founder of Moravian archaeology MUDr. Jindřich Wankel in the Bull Rock cave in the Moravian Karst. 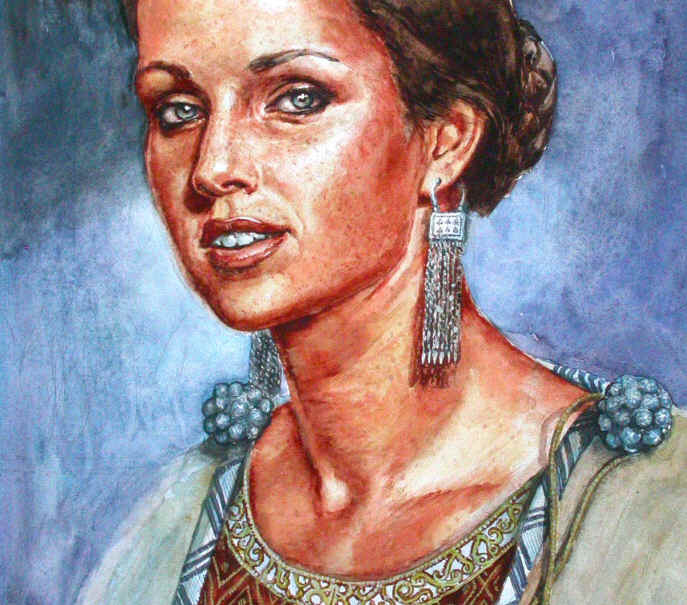 The professional image reconstruction idea - for the City of Prague Museum (tone painting was created in cooperation with archaeologist Martin Golec and professional staff of the Museum of Prague). Crafts and trade boomed during this period. It is named after Hallstatt locality in central Austria. A reconstructed image based on expert advice shows a Hallstatt settlement with a wood workshop in the foreground. Barrows with cavernous wooden structures and rich grave goods are known from this time. An 18-20 year-old girl, whose body was decorated with items imported from distant Eturie (modern-day Italy). Ordinary people, as in today's world, had to settle for cheap imitations of the highly prized fashionable wares. The work originated in co-operation with archaeologist Martin Golec. Late Iron Age – La Tene culture 450/400 B.C. – beginning of A.D. 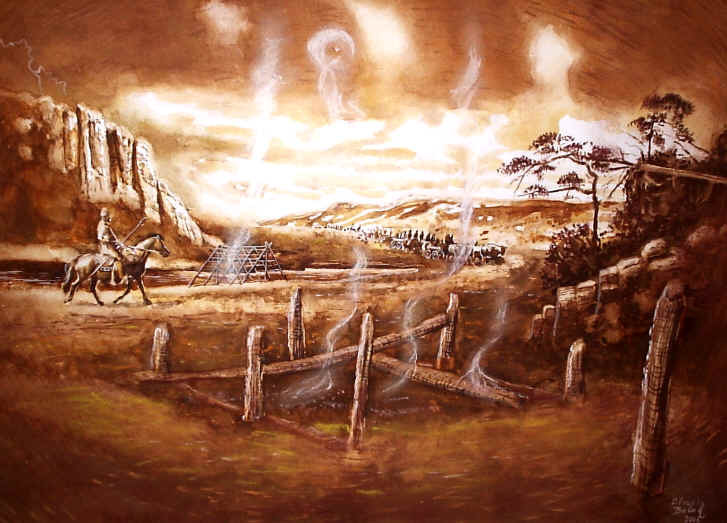 This period is named after the well-known Celtic burial-ground in La Tene, Switzerland. La Tene period lasts until 5th century B.C. 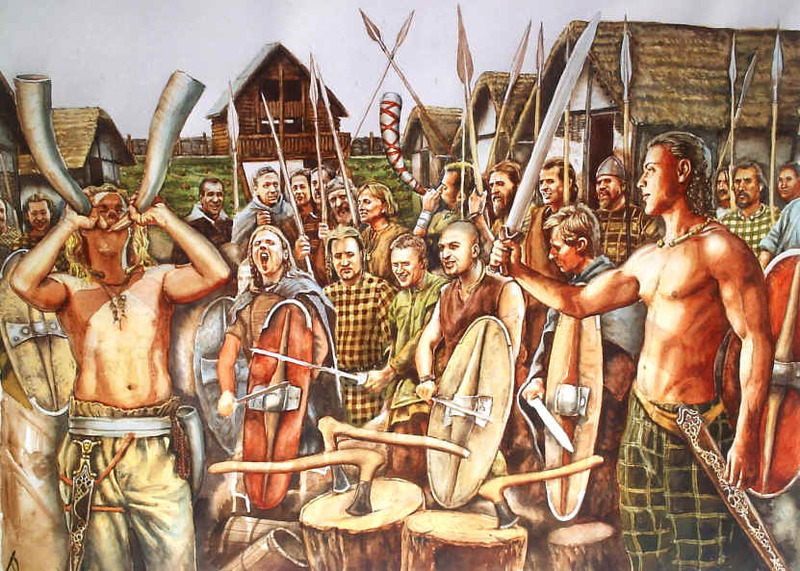 It is associated with Celtic culture and ends with the beginning of the Roman period. 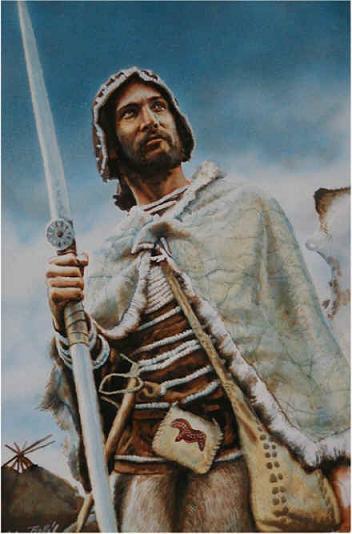 The excavation in Blučina u Brna is also known for the burial of this Celtic warrior. While his bones and weaponry are deposited in a museum, his soul will rejoice in Valhal and will enjoy a more happier, colourful and beautiful life. Free Celtic fighter is a Spirit still intimate with indigenous nations and is bound up with nature and shamanism. Thus he cannot resist a disciplined army for too long, which is commanded by someone unbelievably powerful. The Roman Era lasted for the first four centuries (A.D.) in central and northern Europe when Germanic tribes settled the area north of Danube. The territory which was not under Roman control is called Barbaricum (north of Rhine and Danube). 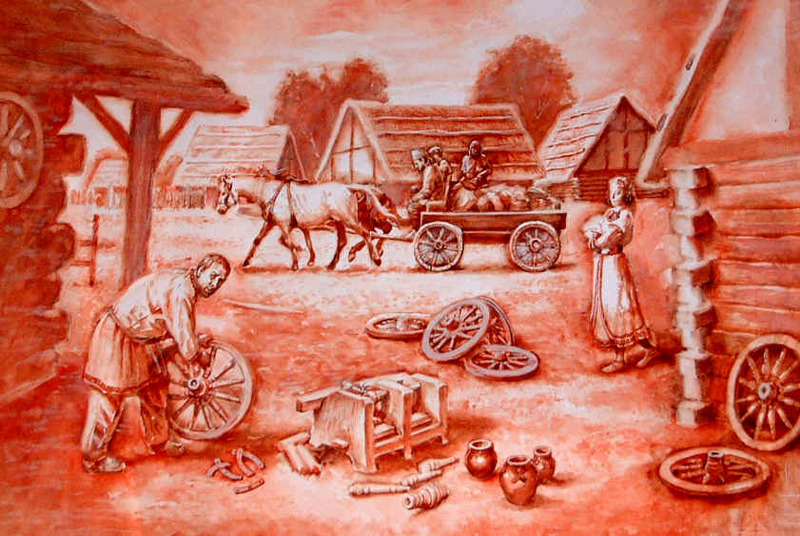 The professional image reconstruction idea - for the City of Prague Museum (tone painting was created in cooperation with archaeologist Martin Hložek and professional staff of the Museum of Prague). The painting pictures iron smelting in crock furnaces. The Migration Period 300–500 A.D. This period is characteristic for tribal migration and shifting power centres in Europe. The tomb of a Germanic magnate from the Migration Period, Blučina u Brna. A clasp on the shoulder, suspended beard-cutting tweezers, ornamental girdle ironwork with a buckle inlaid with semi-precious stones. His cutting weapons and latchets are similarly decorated. This work was possible thanks to consultations and material provided by archaeologists Luděk Galuška and Milan Salaš. Early Middle Ages 600–1250 A.D.
A part of this period is in the Czech Republic associated with Ancient Moravia but also with short territorially expansionary period known as Great Moravia. Ancient Moravia - Great Moravian Empire least 822–1055 A.D. The first evidences about the Moravians come from the beginning of the 9th century. After few more decades, the Moravians were a strong and significant group in Europe. Everyone who wanted to survive had to join the most powerful society. The Christian Europe was united by the Pope; the single rulers still had to fight out everything on the politics and military field. Small tribes could not beat the whole kingdom. The Slavs were spread into many small tribe groups, whereas their western neighbours were united in the Kingdom of the East Franks. The situation was changed by the rebellion against the expanding Avars. After that, an extensive, free and united territory grew up. Nevertheless, even the size of several united tribes is not a guarantee of a survival. That is why the Moravian king Rostislav orientated the politics and religion in the faraway Byzantine Empire in the second half of the 9th century. King Rostislav demonstrated his independence on the Kingdom of the East Franks by inviting the saints Cyril and Methodius to the Great Moravia. However, he was captured and the Moravia was occupied by the Franks. 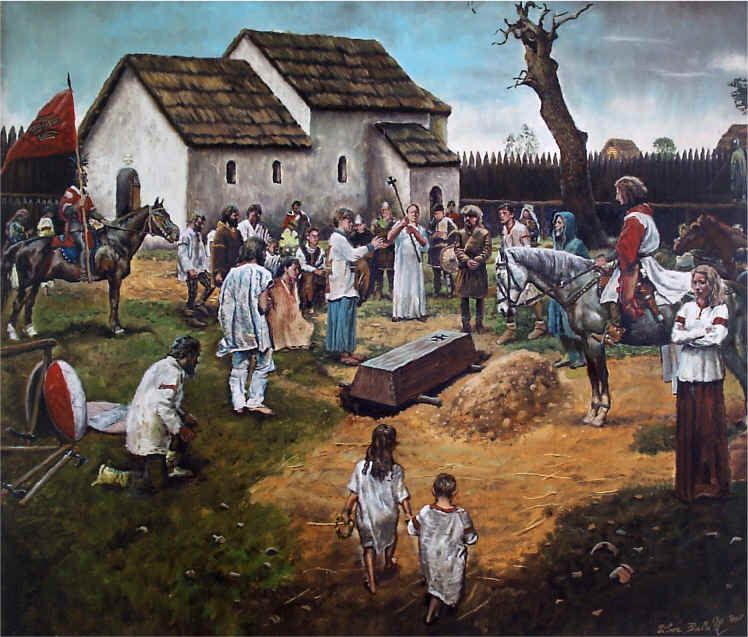 On the beginning of the 70s of the 9th century, the rebellion against the occupants breaks.The priest Slavomír headed the revolt and Moravia was set free. 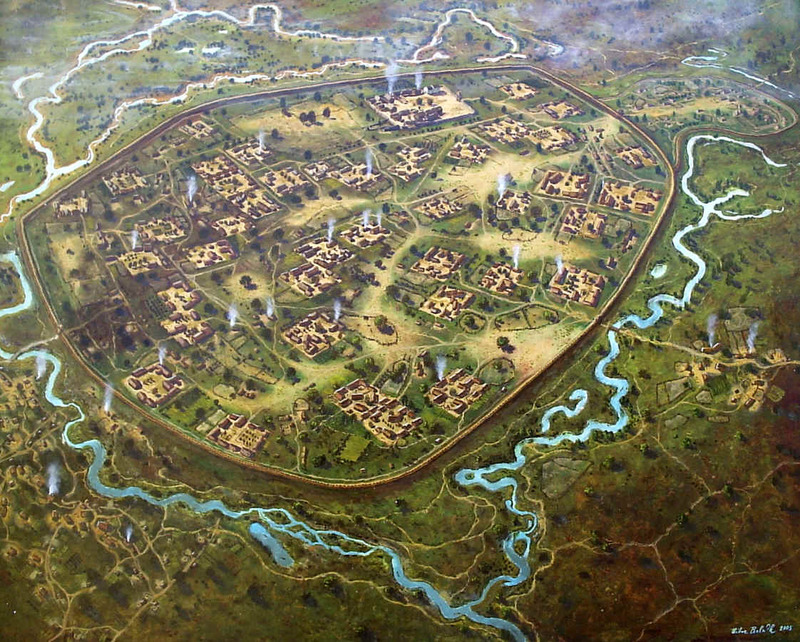 The Kingdom of the East Franks set a retributive crusade, which got to the walls of Veligrad (the Supercity). 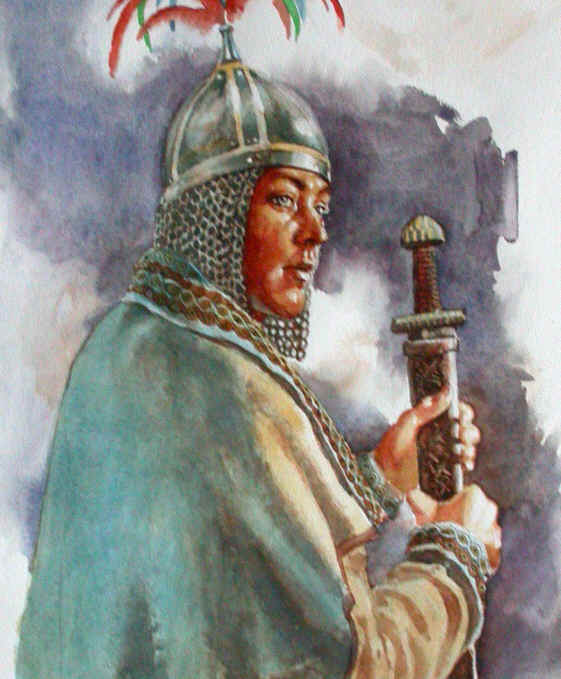 The franks army was led by the competent and intelligent Moravian nobleman Svatopluk. Pretending negotiation, he came to Veligrad while his army was falling asleep after the long journey. Svatopluk suggested Slavomír to attack the tired Franks with his greatly embattled army – and in a few minutes, the elite of the Franks kingdom is defeated. Svatopluk became the legendary Moravian king, whose name will always be connected with the Great Moravia state. He was the only monarch to earn the title “The adoptive son of the Pope” by evangelization in the new territories. An old reconstruction coming from the end of 1980s decade represents the capital of Moravia Veligrad (Rostislav´s Old Town or Moravia). The city stretched out on the area of two today´s towns – Staré město and Uherské Hradiště and surrounding fields. The rests of the walls are apparent up to the present day. In the middle of the painting is a palace with a rotunda. 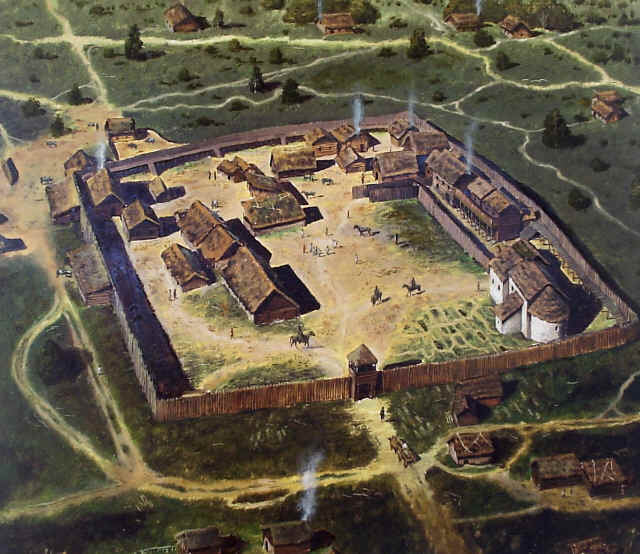 The reconstruction was made as a comics frame by the couple of authors Libor Balák and archaeologist Luděk Galuška. The painting of a Moravian magnate with a superbly decorated grasp of a scimitar. Famous, exquisitely-made articles of this culture include jewellery, studs and ear-rings; examples of the unique skills and creative flair of the ancient artists. The professional image reconstruction idea - for the Museum Břeclav (exposure - castle Pohansko). Fortified prince court. Cemetery is adjacent to the church. A small three-dimensional model was built prior to this reconstruction. In this yard, we can see a church funeral. Numerous stakes standing side by side in lines illustrate textile manufacturing factory. 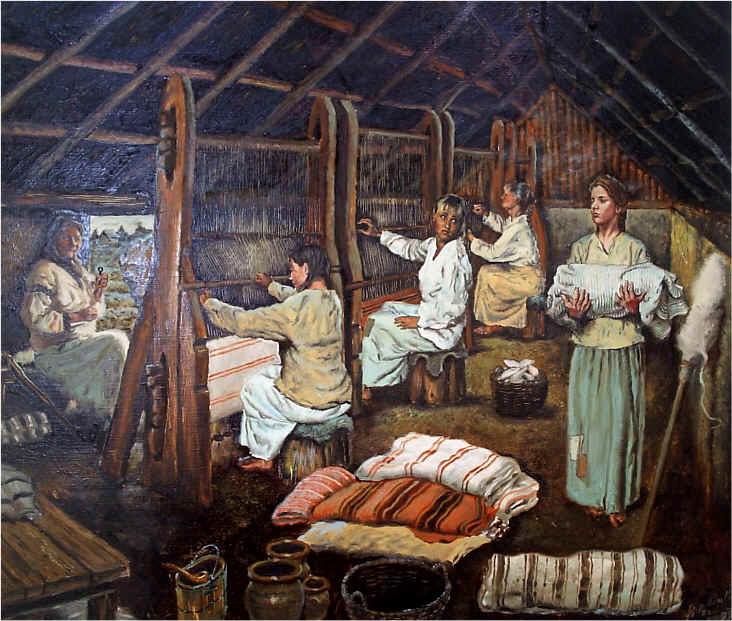 The female weavers in the picture are slaves. Part of a river bridge and a road leading to the gate is visible outside the walls. The gate was excavated during the archaeological excavation. 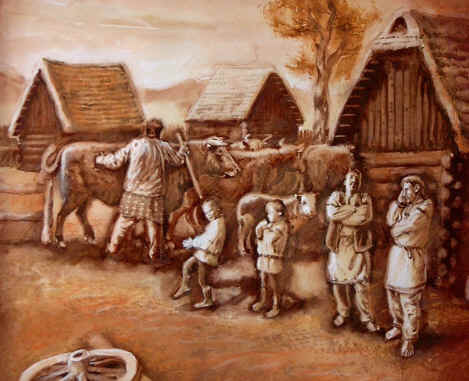 Originals of pictorial reconstructions can be viewed at Zámeček na Pohansku near Břeclav in southern Moravia. 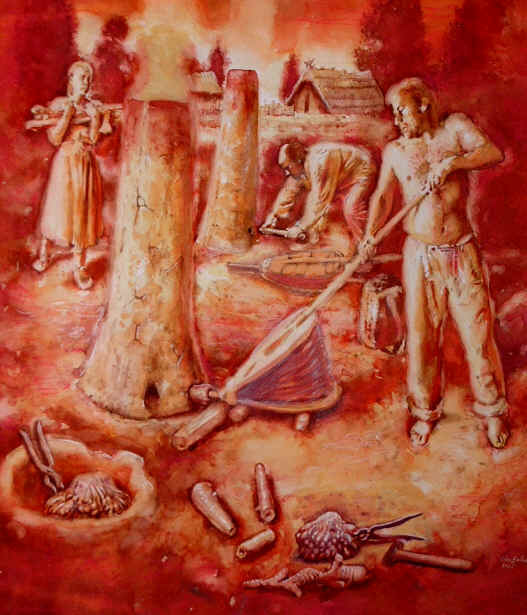 The following archaeologists helped with compiling material for the creation of paintings revisiting Ancient Moravia: Jiří Macháček, Jana Vignatiová, Josef Unger and Luděk Galuška. The photograph depicts archaeologists of an international team led by Dr. Jiří Macháček uncovering part of a stone wall from a rampart at Pohansko. In 1055 A.C., the Czech duke Spytihněv got rid of the 300 most important Moravian noblemen and deprives their estates for the purposes of the Přemyslid dynasty. This property was divided among the Czech church institutions and nonclerical owners, gathered around the duke. These members of the upper class replaced later the ruling magnates. The last property and law connections with the old Great Moravia disappear. 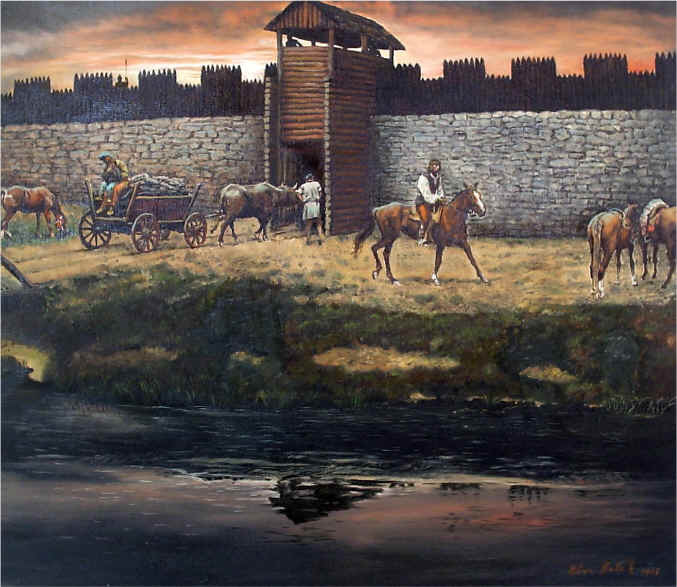 The old reconstruction of the castle in Lelekovice (Brno) shows one of many standard fortresses. The picture was made as a frame in a comics by the couple of authors Libor Balák and archaeologist Josef Unger. The architecture responded to the restless times and was constructed to combine walls and moat. 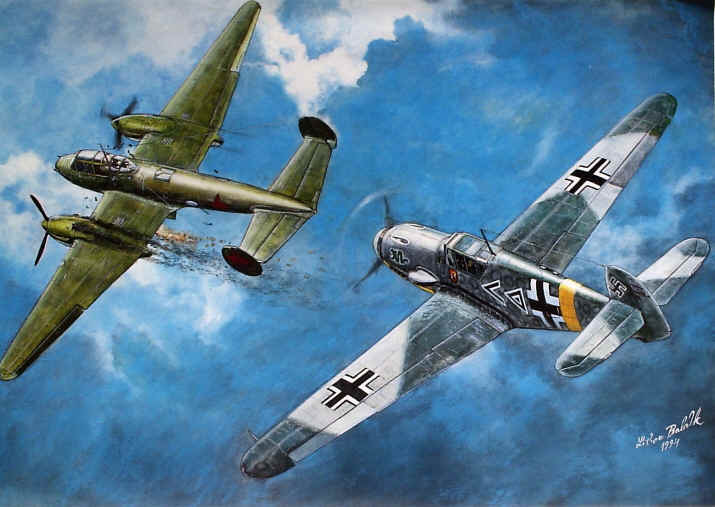 WWII aircraft battle brings us into a well-documented time due to the availability of written documents, technical plans, photographs, films, and also living observers. The image of a human battle using modern technology is, in principle, not all that different to the war scenes depicted in Mesolithic rock art scenes. Sorrel black-and-white images, technical documents and records enable colour picture reconstructions of specific events. The reasoning is the same as in the case of ancient cultures; so they are not forgotten and so we can learn the fascinating stories of our ancestors, which helps us to understand our own culture and to find ourselves.